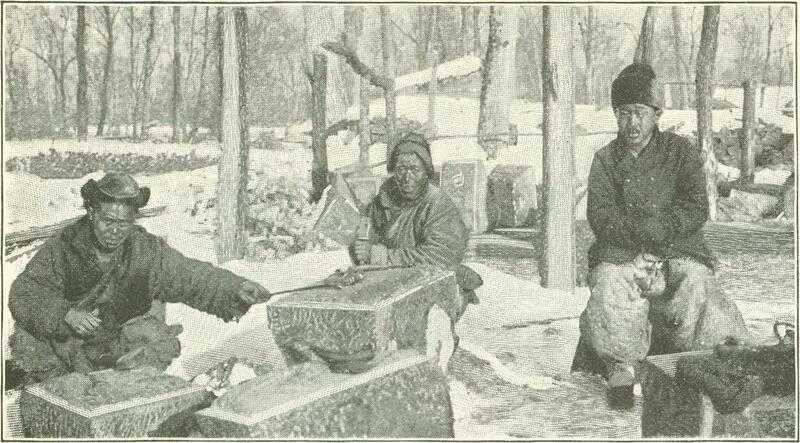 Work was then commenced on the last sec­tion of the road toward the Amur River. 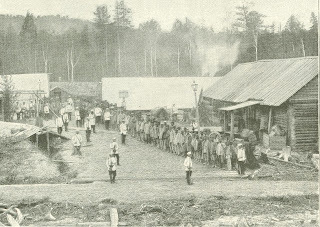 For one-third of the 600 miles from Lake Baikal to Stretinsk, on the Amur, tracks are already laid; for another third the work is well under way, while from the Pacific coast barges with construction material for work from that end are beginning to arrive at Stretinsk, the head of navigation on the Amur, and now to be the terminus of the Trans-Siberian Railway, strictly so called. 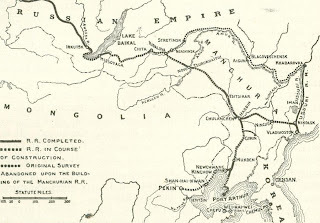 As originally projected, the road was to have been continued along the Amur, which is here the boundary line between Russia and Manchuria, to the Pacific. In fact, it had been surveyed 1,600 miles from Stretinsk to Khabarovka, the terminus of the Ussuri Railroad, running north from Vladivostok and already built. But all intention to utilize this northern route was abandoned more than two years ago, when Russia first began to absorb Manchuria. At Stretinsk, govern­ment steamers take up the journey and ply up and down the river during the open sea­son, so that even by next spring, when the railroad will be completed to Stretinsk, St. Petersburg will be in direct full communica­tion by rail and boat with Vladivostok and the Pacific provinces. In fact, the Trans-Siberian road is even now considered practi­cally completed, and the $150,000,000 thus far appropriated to pay the cost of con­structing it will, in all probability, suffice to finish the work. The center of interest in the Far East now is not the Trans-Siberian line proper, but the Chinese Eastern Railway, that shortened way by which, through the complacency of China, the Trans-Siberian line is to find its chief outlet to the Pacific. 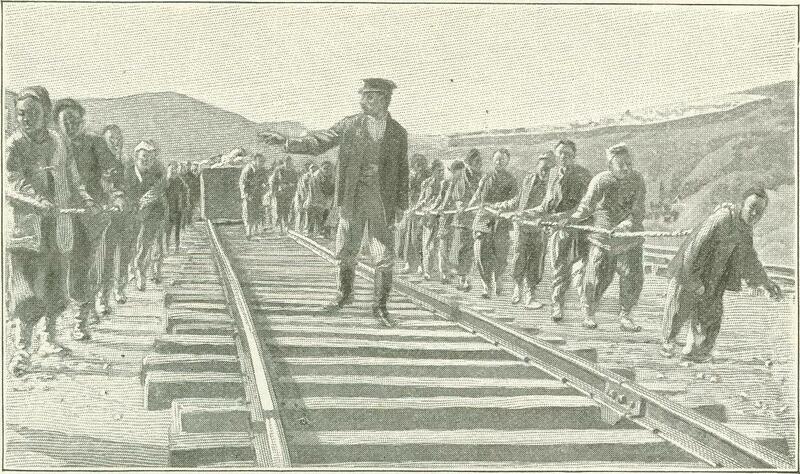 No railroad has had such a remarkable history as this Chi­nese Eastern; and no railroad has been built under such seemingly insurmountable difficul­ties. And yet it holds the world's record for rapid construc­tion. 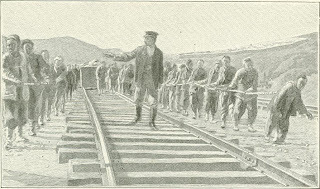 In 1896, a year after peace had been declared between China and Japan, Russia entered into a contract with China to build a railroad through the Chinese prov­ince of Man­churia, guaran­teeing that, the president of the line should be a Chinaman, and that at the end of eighty years the entire owner­ship of it should pass to the Chi­nese Government upon payment. 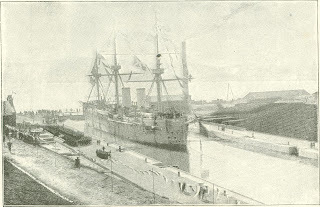 Then, in the spring of 1898, Russia leased Port Arthur and the entire Liao-tung peninsula from China, thus securing a Pacific port that is free from ice through the entire year, which her own port of Vladivostok is not. And as soon as Port Arthur was acquired, it was decided to make that the main terminus of the Chinese East­ern (and consequently of the Trans-Siberian) road, instead of ice-bound Vladivostok. Kidalova, in Siberia, fifty-three miles east of Chita, where it leaves the Trans-Siberian road and runs southeast in a straight line 600 miles to Harbin. There, 500 miles from Vladivostok, it crosses the Sungari River, and what is now really the main line turns almost due south, and con­tinues on 650 miles to Port Arthur, while southeastward from Harbin runs the line, or branch, to Vladivostok. From the main line, south of Harbin, a branch will be constructed southeastward to Girin; and an­other, farther south, is about completed southwestward to Newchwang. And the latter branch - to the final triumph of Rus­sian diplomacy and the perfection of Russian dominance in China is to be pushed on, when the road will connect with Pekin, the capital of China. A year and a half ago the very locations of the various lines of the Chinese Eastern were in doubt; to­day the road is all but completed. Through the great wheat-growing valleys of central and southern Manchuria the engineers had an easy way prepared for them. From Kidalova to Tsitsikar, however, the country is repeatedly crossed by rugged mountain chains. But for this inhospitable and al­most insurmountable sec­tion, trains would be run­ning through from St. Petersburg to Port Arthur before next Christmas. To finance this undertaking, the expense of which no man's brain could compute beforehand, the Russo-Chinese Bank was organized, with headquarters at St. Peters­burg. It now has branches in every city of the Far East, and honors all requisitions of the rail­way officials for however large a sum. The engineers have orders to build the road, and draw money as it is needed. While practically the Chinese Eastern Railway is altogether a Rus­sian enterprise and the final sec­tion of the Trans-Siberian Rail way itself, the greatest care is taken to keep the two companies outward­ly, at least, separate and distinct. Thus the docks at Vladivostok, built at enormous cost, were originally the terminus of the Trans-Siberian Railway; but now they have become practically the property of the Chinese Eastern Railway. We have already seen how, under the original compact between China and Russia, the president of the Chinese Eastern is always to be a Chinaman. It has throughout its own separate officers and management. It has a flag of its own, half Chinese, half Russian; and the Cossacks who guard its lines have been compelled to adopt a uniform which, like the flag, is part Rus­sian and part Manchurian, and they are no longer even known as Cossacks, but as the Manchurian Ochana (guards). The Chinese Eastern Railway has a pecu­liar and special interest for America. If it is building with a rapidity never before ap­proached in railroad construction, the fact is largely due to American ingenuity, trust­worthiness, and energy, for the tools, ma­chinery, and materials with which the work is done are largely of American production; and the promptitude and skill with which these have been supplied, despite the great distance separating the United States and Manchuria, are not the least of the many wonders that have marked the whole enter­prise. Naturally, we did not secure so emi­nent a part in the work without effort on our own part; and the story of how our ability to serve them was first brought con­vincingly to the attention of the builders of the line is nothing less than roman­tic. 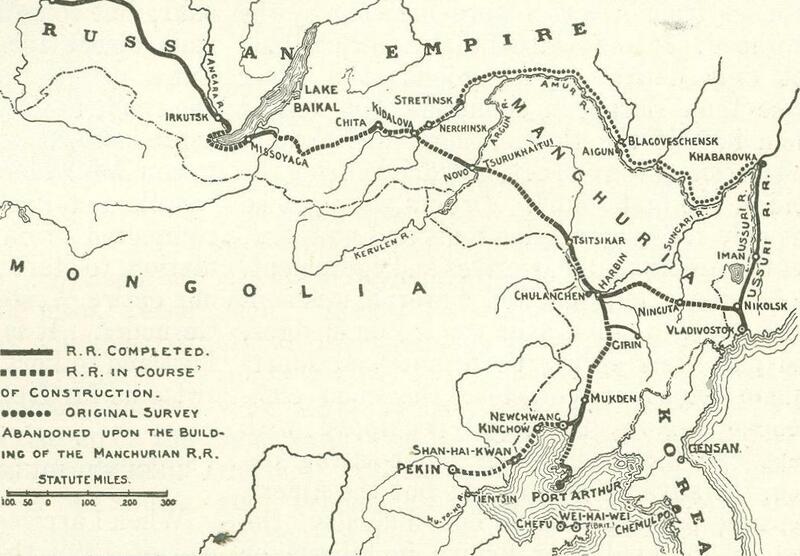 As the Trans-Siberian line drew nearer to the Pa­cific, Mr. Ser­gey Friede, a member of the Engineers' Club of New York City, became convinced that, if the matter were properly man­aged, a market for American railway machin­ery and materials could be found in eastern Siberia and Manchuria. Being thoroughly conversant with affairs in north­ern Asia, and also familiar with the Russian lan­guage, he de­cided to try to effect such a relation in those localities himself. In the spring of 1897, therefore, he set out for Vladivostok. On arriving there, how­ever, he found that the engineers would not listen to what they regarded as his fabulous tales of American supremacy in the manu­facture of tools and machinery, and the chief engineer was off in the wilds of Manchuria, somewhere on the Sungari River. 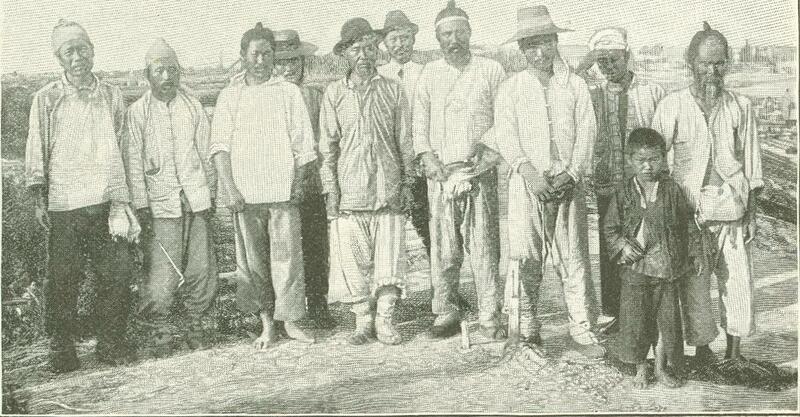 The coun­try was at that time unexplored by any white man, and engineers were setting out for the Sungari River to find and survey a route through Manchuria to the Siberian frontier. There were no means of following them, so Mr. Friede determined to go to Newchwang and proceed northward in the hope of meeting them. On reaching New­chwang, he fitted out a cavalcade at his own expense, and then set off with his compass and instruments, to cross a section of country never before entered by a white man. The greatest and strangest difficulties were encountered. Al­though Mr. Friede car­ried a passport vised by the Viceroy him­self in Pekin, a for­midable-looking docu­ment of brilliant red, fully three feet long, he found the local offi­cials extremely suspi­cious and fearful of him; and often in the villages and towns he came to it was diffi­cult to get accommo­dations for himself and his party. Properly speaking, there were no roads, only rude, uncertain trails. As a rule, it was little use to ask for information about the way. Occasionally, if a proper bargain was struck, some marvelous adventurer who had actually traveled twenty miles from home would hazard some uncertain direc­tions as far as to the next village. In the latter part of the journey there arose much anxiety regarding highwaymen, who were re­ported to abound and operate rather boldly in those parts. And once, when his cash wagon got away from him, Mr. Friede thought he had really fallen into their hands; but the thief proved to be the man who was driving the wagon, and it was soon re­covered. In spite of all obstacles and hardships, the party got through, and one day, at a point near the Sungari, a body of Russian engi­neers, intent on their surveying instruments, were astonished at hearing someone call out in excellent Russian, "Is this Engineer Iu­gowitch's surveying party?" They were dumfounded at the sight of a stranger, and a white man, emerging from the forest, and could not believe that Mr. Friede had crossed the country they were about to penetrate. 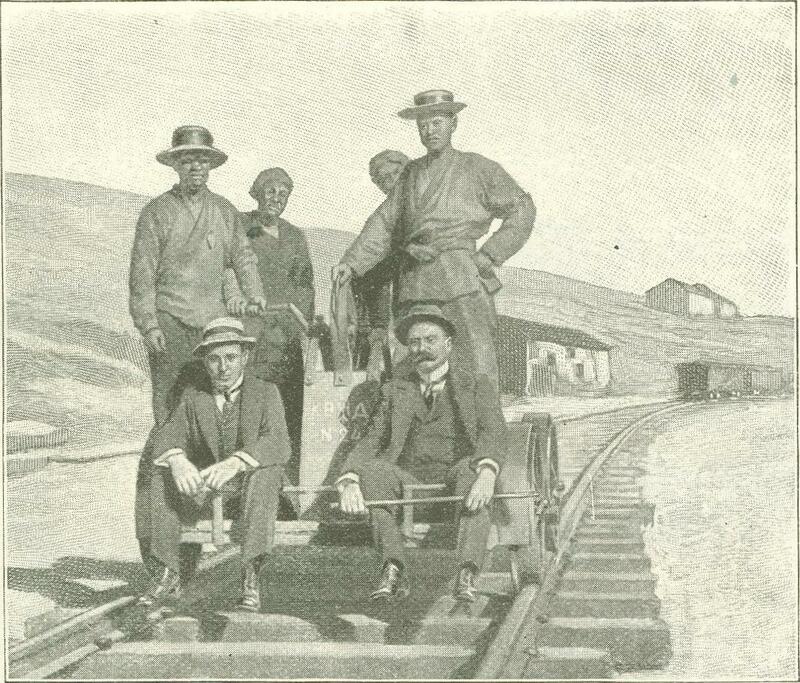 A friendship was at once struck up, and the engineers proved more than willing to listen to arguments in favor of machinery and railway supplies that could reach them in weeks instead of months. 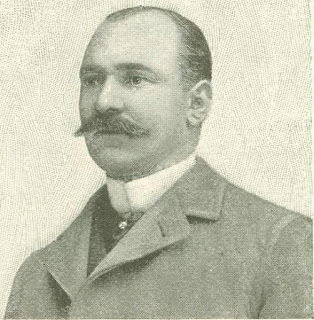 Mr. Friede soon after began his homeward trip, to inform American manufacturers that Siberia and Manchuria were open to them. 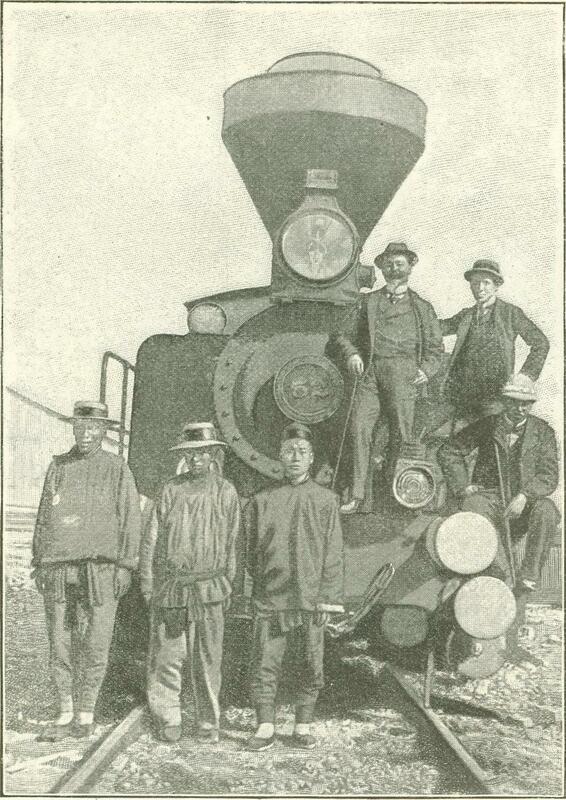 With the arrival of the first invoice of American tools a new era began in railway construction in the Far East. 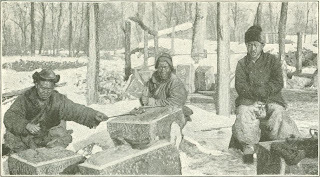 It was found that the American pickaxes, hammers, and shovels were of better quality than those of European make, and were capable of heavier work. 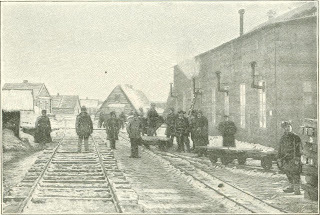 New orders for American material on a larger scale were given, and before the close of navigation in November, 1898, American rails, locomotives, hand-cars, and even cross-ties were delivered in central Man­churia, while at Vladivostok and Port Arthur supplies from America were arriving by the ship-load. It was realized that America could not only deliver better goods at a lower price than European countries, but deliver them in half the time. England, Belgium, and Germany were practically driven from the field in the first round. 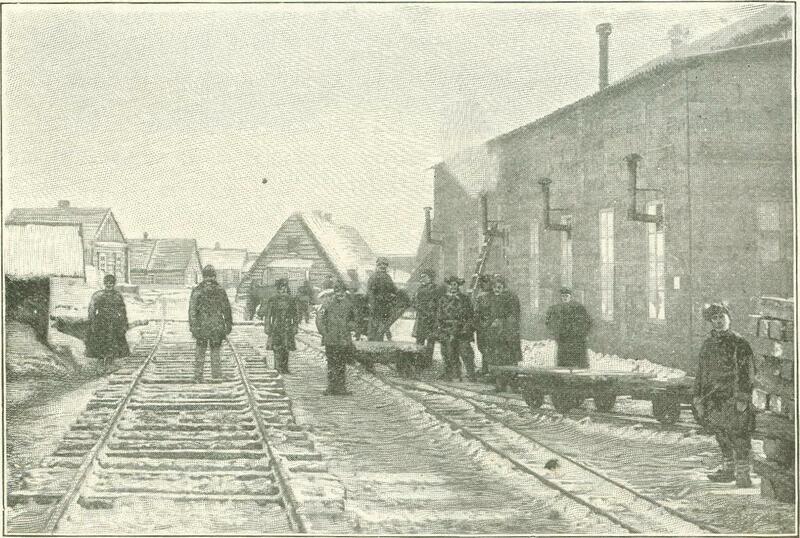 Orders were placed not only for construction tools and material, but for American locomotives and equipment. All winter long belated material was sent from point to point over the ice on sledges, and early this spring the great final super­human effort to complete the road com­menced. 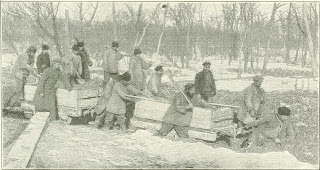 Now, thoroughly equipped with American tools and every labor-saving de­vice, the advance was rapid; but the Ameri­canizing process caused one difficulty, the first of its kind ever known in Siberia or Manchuria - a strike. 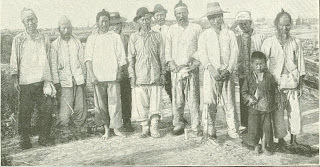 Tens of thousands of coolies were at work along the line of road this spring when the American rock drill was introduced by Mr. Friede. The Manchus dropped their chisels, ceased chipping rock, and watched the drills thumping away hour after hour, apparently without motive power, drilling deep into the rock; they saw dyna­mite used, a sheet of flame burst forth and the rock fly in great fragments - then they struck. Such performances were against all their traditions, and nothing could induce them to return to work. Even the Russian laborers caught the contagion, and joined the strike. The entire line was locked up and inactive for three days. However, the Cos­sacks did not go out with the strikers, and an adjustment was finally made, and the coolies returned to their labors. Now they enjoy nothing more than watching the drills pick­ing away at the rocks, firmly believing that they work solely .by the power of the white man's "devil." To round out the store of our own pros­perity in this great enterprise, the repre­sentatives sent around the world this past summer by Chief Engineer Iugowitch to find the best market for material, after spending several months in America, officially reported that of the millions yet to be used to com­plete the Chinese Eastern Railway, more than seventy-five per cent can be spent to the best advantage in the United States. Moreover, this last summer a contract for all the bridges still to be placed was given to an American firm, and they have now crossed the ocean, and are on their way in sections overland to their various destinations in Sibe­ria and Manchuria. From now on most of the material will go to Port Arthur after trans-shipment at Nagasaki; but sometimes a whole cargo of tools sails direct from New York, via the Suez Canal. 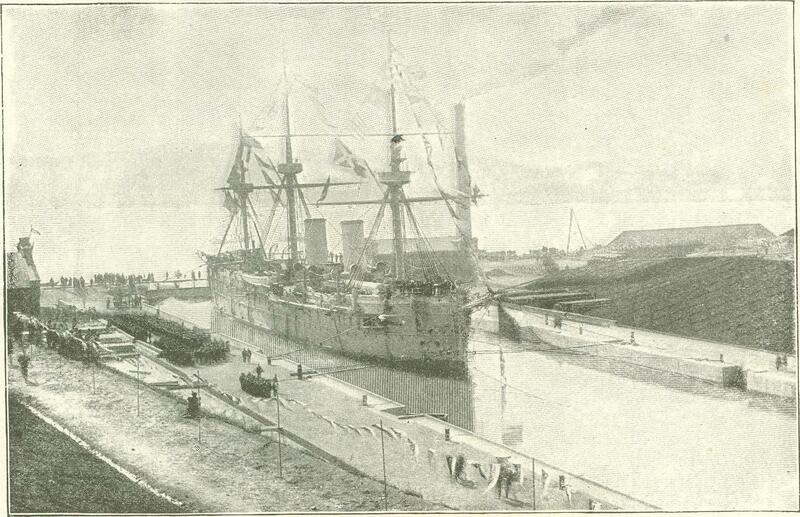 With the approaching completion of the road, the Russians are encouraging the establishment of a direct steamship line be­tween San Francisco and the ports of Vladivostok and Port Arthur, for with the road completed a rich country of 10,000,000 population to start with, will be brought nearer our entire Western country than England or Germany. It is but about 6,000 miles from Portland to Port Arthur by water, and nearly twice as far from competing Europe by rail. 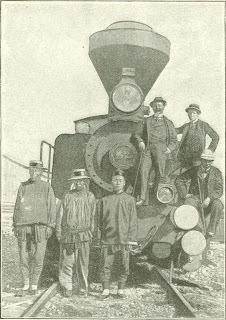 When I arrived at Port Arthur in the summer of 1899 the first train was just about to run for a short distance on the section between that city and Harbin. 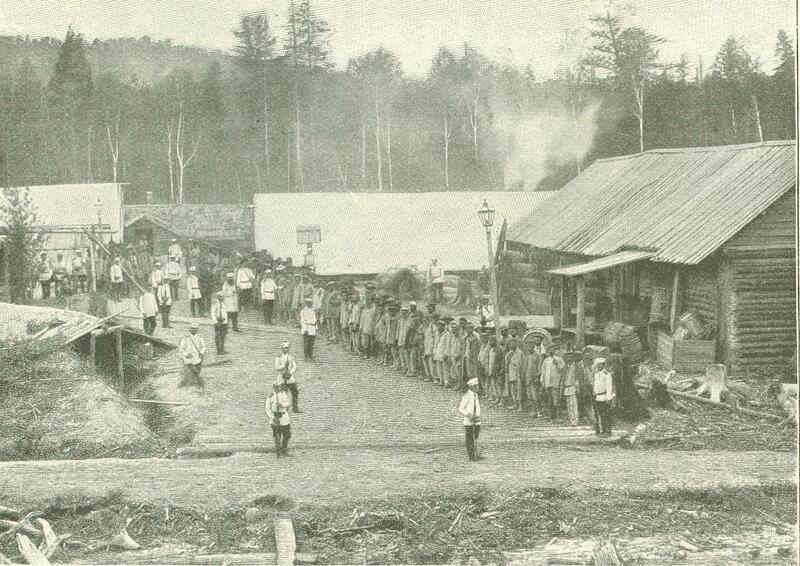 Everywhere on the wharves and along the line of the railway were piled mountains of construction material, each piece bearing the stamp of some American firm, and on each pile sat cross-legged a Cossack guard, musket in hand. He had been there for months past; he will remain until the last bit of material is used. 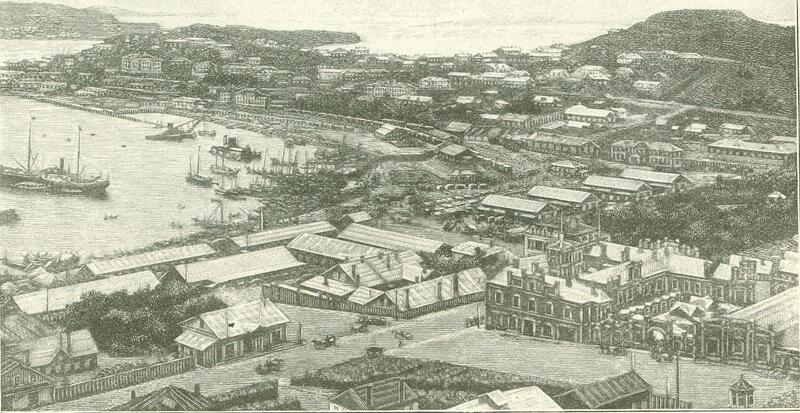 And what changes have taken place in Port Arthur during the few months of Rus­sian occupation! Many Americans are famil­iar with Western towns that spring up in a night, as it were; but to see a city of stone constructed before your eyes is an unusual sight. All day long an army of coolies, thousands strong marches from over the hill made historical by the Japs climbing over it to enter Port Arthur during the war. Each half-stripped man carries two small open baskets suspended from either end of a pole which he bears on his shoulders. Na­ture has prepared the little rocks with which the baskets are laden - the hills are literally composed of them - and they are used to fill in the low ground behind the breakwaters which are being constructed day and night by this line of two miles of humanity. Each jostling the man in front of him and the one behind, they can be seen marching over the mountain eternally. In the crevasses of these hills, made by summer rain, these coolies are also building their villages - of either flint rocks, picked up everywhere, or sun-dried mud bricks of native manufacture. The square, one-storied houses rise up on the sides of the ravines in terraces, the roof of one serving as the veranda of the one above, or as the roadway for a village street. And in all this mass of humanity a woman's face is never seen. Even in the homes of the officials of the railway the sight of a woman's face is rare; indeed, so rare that among all the 20,000 workers and as many soldiers in Port Arthur, it is doubtful if there are two-score women. Everything gives first place to commercial progress : there is not a temple of any kind in the city; the Chinese joss houses have been turned into offices for the employees of the Chinese Eastern Railway and the Russo-Chinese Bank ; and the pretty little Greek church, lately built, stood dull and unlighted during the gay Eastertide (the first Easter­tide, by the way, ever celebrated in this thousand-year-old town), because the engi­neer could not spare any of his 20,000 work­men from the railroad, to put on the finishing touches. In addition to the 20,000 coolies at work building fortifications and filling in low ground where massive stone piers are being constructed, there is another army of 20,000 stationed here - Cossacks, encamped in the various walled barracks that a year ago were Mandarin palaces. And in the harbor are a score of warships; and there are always a few hundred sailors ashore for a spree. It was in June of this year that I traveled on the first locomotive to turn wheels on the completed section of the Port Arthur branch of the trans-continental railroad. Every­where were great changes. It was an Ameri­can locomotive, as were the rails and cross-ties over which it ran, while on every piece of construction material lying about was to be seen the trade-mark of some en­terprising Yankee. In the cab, too, with the engineer was the American who had brought this marvel to pass. 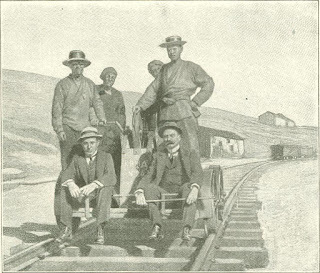 Mr. Friede was again in Manchuria, an honored passenger on the first train to start from the southern terminus of the longest railroad in the world. We had started out for Chulanchen, orig­inally the central meeting-point of all the trans-continental systems; but upon arrival there we discovered that the city had been abolished several months previously. The extremely low water in the Sungari River last summer a year ago prevented the larger steamers from making their way to Chulan­chen. 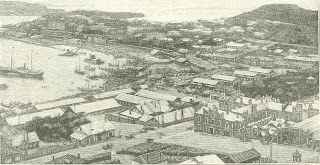 So the engineers decided to take the city to the steamboats; and machine-shops, round-houses, offices, banks, and residences were moved thirty miles down the river to deep water, and the new location christened Harbin. It is not to be found on any printed map, yet Harbin is destined to become the Chicago of northern Asia. Already it is a city of magnificent offices and dwellings, to say nothing of broad avenues lit by electri­city by night, and patrolled during the day by American steam rollers, crushing rock and building asphalted roads. A Yankee-im­ported ice plant is now being erected, and everywhere about the railroad is seen the evi­dence of American commercial supremacy. The trip down the Sungari and Amur rivers again revealed the wonderful revolutionizing methods of Russia's mighty hand. Two years ago the trip was possible only by Chi­nese junks, and weeks were consumed, while now palace steamers run regularly for nearly 2,000 miles to Khabarovka, where direct rail­road communication with Vladivostok is main­tained the year round. At Nikolskoy, sixty miles north of Vladivostok, where the Chinese Eastern Railroad to Harbin makes connection, a sleeping village has suddenly grown into a town, and this summer it was officially advanced to the station of "city" with full privileges. The word Vladivostok signifies in Russian "The Glad Far East," but, alas! I found that its glory had departed. Three years ago the government at St. Petersburg was ap­propriating millions upon millions for the improvement of the port. 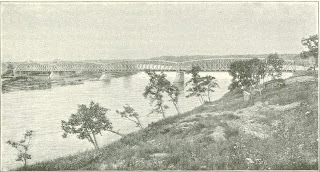 A granite pier nearly a mile long was constructed. Im­mense floating dry-docks have just been com­pleted at an enormous outlay ; and last winter colossal ice-breakers kept a channel to the port free from ice, so that Vladivostok for the first time in her history was not shut off from the outside world during the coldest months. Speculations in real estate reached fever heat. 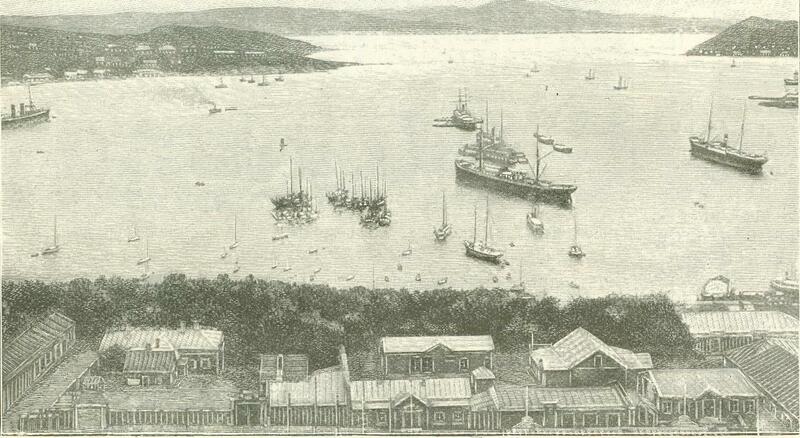 Then came the acquisition of Port Arthur, and in a twinkling, officially, Vladivostok was deserted. Side-tracked, she became a secondary port, a mere mili­tary outpost. The fleet sailed away to oc­cupy Port Arthur, the railway offices were removed to Chulanchen, and are now located at Harbin. The supremacy of Vladivostok has vanished, but around her is springing up a population that may yet redeem her with­ered hopes. So near is the completion of the railroad that connects her with Europe, that rates for passenger travel have already been established. They will be extremely low $102 from St. Petersburg to the Pacific, first-class fare, with third-class fare much less. At present the fare by rail and camel, or troika, is advertised as $160 for the entire distance from ocean to ocean. One of the possibilities of the closing days of the Paris Exposition next year is a half-Cossack, half-gendarme guard, who will call out at the railway station, "This way for trains from Paris to Port Arthur " - a distance bor­dering on 10,000 miles, through France, Germany, across European Russia via Mos­cow and the road now building to Perm, where the great trans-Siberian road may be said to really commence. One change of cars would probably be necessary, for the Russian and trans-Siberian roads have a gauge of five feet, which is, with one excep­tion, the widest in the world. But for this, it will be a ride straight through - and a ride of what novelty and wonder in landscape and products and people! 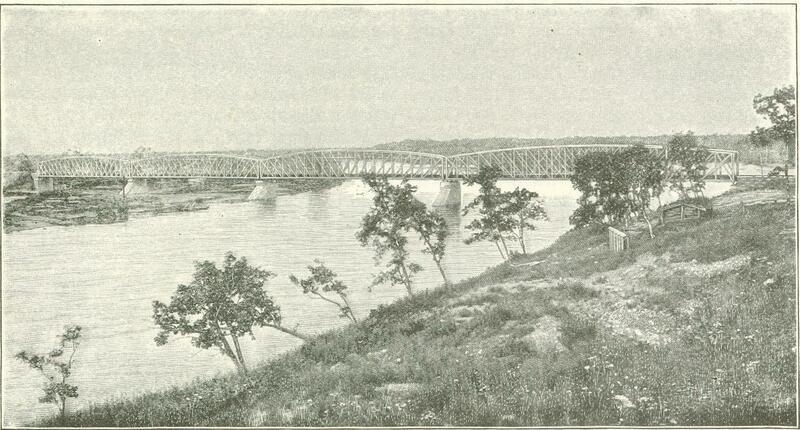 Originally published in McClure’s Magazine in November of 1899.